Director Kathryn Bigelow’s Iraq war film ‘The Hurt Locker’ opens intensely as we observe a bomb disposal unit which consists of Sgt. Matt Thompson (Guy Pearce), Sgt. J.T. Sanborn (Anthony Mackie) and Spc. Owen Eldridge (Brian Geraghty), amid a healthy amount of male bravado humor, operate a remote robotic unit in an attempt to defuse a roadside explosive. Unfortunately this particular situation requires the team lead, Sgt. Thompson, to don on his protective gear and manually defuse the device which doesn’t go nearly as well as intended and another Iraqi war statistic has been logged. From these brief early scenes we were able to get a sense of camaraderie, even friendship from this particular team, a closeness which seemed necessary to help these men cope with and complete one of the toughest jobs in situation filled with difficult jobs. Then again maybe it’s not all that necessary. Enter into the fray Sgt. Thompson’s replacement Sgt. William James (Jeremy Renner). Sgt. James has very little interest in making nice with his teammates. Where we initially thought that manually defusing these bombs was a last resort, to Sgt. James it appears to be his first choice of action. Where Sgt. Sanborn’s main job function used to be to guide and advise his team lead, his guidance and advice to Sgt. James falls on deaf ears who seems to have some kind of death wish. Where our other two soldiers count down the days to when their tour is over, Sgt. James is addicted to the adrenaline and through flashbacks we observe he can barely function in the outside world. is made up of absolutes and idealism. Good and Bad, Right and Wrong, Black and White, Life and Death. On the other end of the spectrum Spc. Eldridge, all things considered, has a soul that’s indicates he should’ve never opted for this man’s military while Sgt. Thompson performs his duties as the consummate soldier. Every man has a job, you do yours, I do mine and we all get out of this thing alive which is in direct conflict to the way Sgt. James sees things in his world, which is the dynamic that drives this movie forward. The fact that ‘The Hurt Locker’ is a good as turned out is quite the impressive feat for the director as this is a war movie that is largely dialog and character driven, one devoid of fancy cuts and editing tricks though certainly not devoid of action and yet is a film that manages to be as tense and as taut as any film that I’ve recently seen. Since this work is largely character driven, the strength of the film lies within these characters who we spend a considerable amount of time with and who we get to know quite well. This works well for ‘The Hurt Locker’ because these were characters were able to form some kind of emotional bond with audience, whatever your feelings are about these characters may have been by the films end. As we observed earlier Jeremy Renner’s character of Sgt. James is constructed of absolutes, the kind of absolutes that is the stuff of heroes but not necessarily the stuff that makes good soldiers. One of the high points of this film, one that is filled with numerous high points, is the highly contentious relationship between Renner’s James and Mackie’s Sanborn, considering Sanborn is the consummate soldier performing only what his position requires while James, to Sanborn’s increasing frustration, has no interest in following protocol, has his own set of rules that he applies to either his notion of the greater good or perhaps for personal glory. You decide. 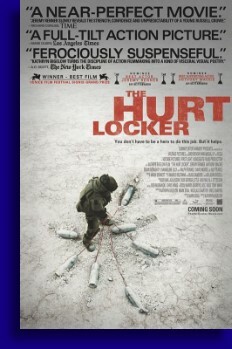 ‘The Hurt Locker’ does run long and it is deliberate in its pacing but I suspect this is done largely by design, somewhat mimicking the aspects of the realities of this particular war which features long stretches of down time punctuated by sudden bursts of life threatening action. Even during these down moments there’s never a feeling of ease as there is always tension, be it from the enemy combatants or the soldiers themselves in the way they are relating to each other. ‘The Hurt Locker’ is a fine film which colors the perils of this war and the characters taking part in this war in a very illuminating way. It is also a film that seems to be one without political motivation or an agenda that tells a deceptively simple story, a story that becomes as complex as you allow it be.